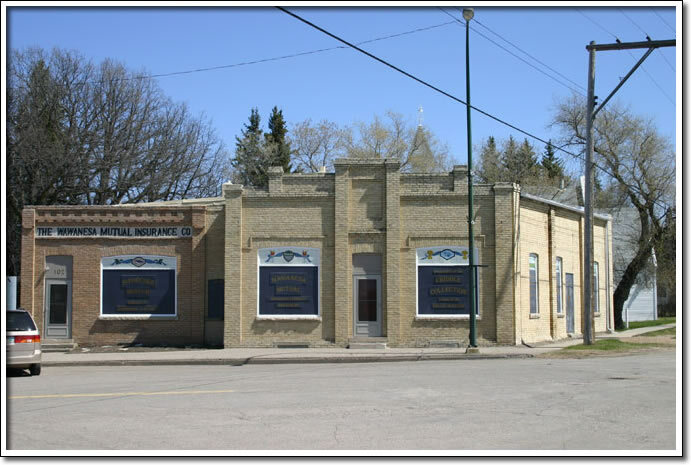 The Wawanesa Mutual Insurance Company Building, constructed as the head office of a rapidly expanding local enterprise that now functions across Canada, is a fine representative example of an early twentieth-century rural commercial building. The structure’s confident facade, simple but detailed brickwork, and corner location reflect both the optimism of the company’s early officers and the practical instincts that allowed them to prosper. Established in 1896 by Alonzo Fowler Kempton and Charles Kerr, Wawanesa Mutual is now one of Canada’s largest property and casualty insurers. The firm, which continues to be a mainstay of the Wawanesa-area economy, also sells life insurance and operates branches in the United States through associated companies.